Having one desoldering Iron with absorbing gun and one soldering iron in one station. Exceptional high-performance PTC in the desoldering iron provides a long life and continuously controlled supply of heat, suitable for desoldering all type of components and easy removal of the residual solder. Thermostat function suitable for soldering different components automatically. 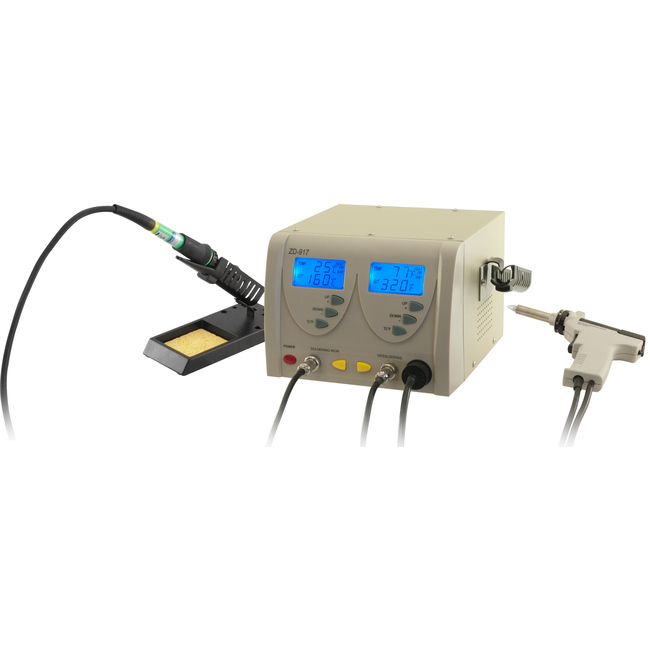 The soldering iron and desoldering iron can be used independently or at the same time. The temperature sensor on the top of the tips can check the tip temperature quickly and decreasing the possibility of the tip temperature falling off during the operating and suitable for lead free soldering.